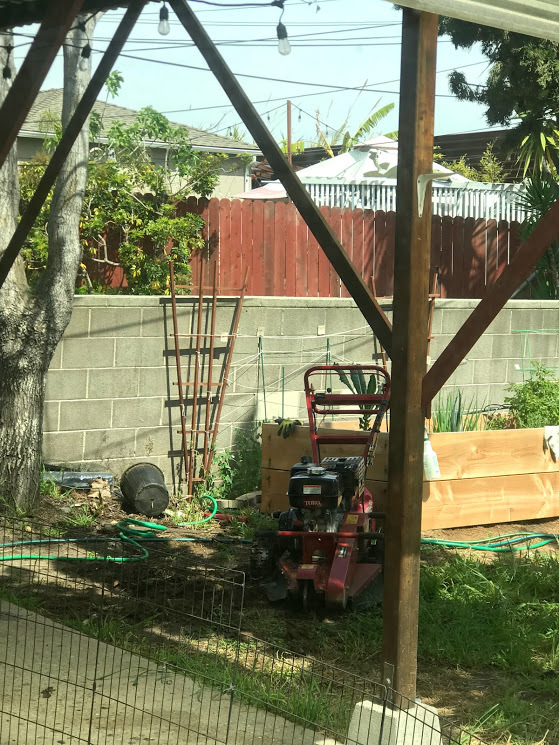 While the plumbing situation is still in progress and our contractor is dealing with the city for final approval on our blueprints, we spent the weekend cleaning up the backyard. Saturday morning was spent at the beach before we rolled up our sleeves and got to work. Alex tackled the leftover tree stumps on the side of the house while I tended to our raised veggie bed and fruit trees. The previous owners had leftover landscaping blocks which I used to section off the peas and pumpkins. 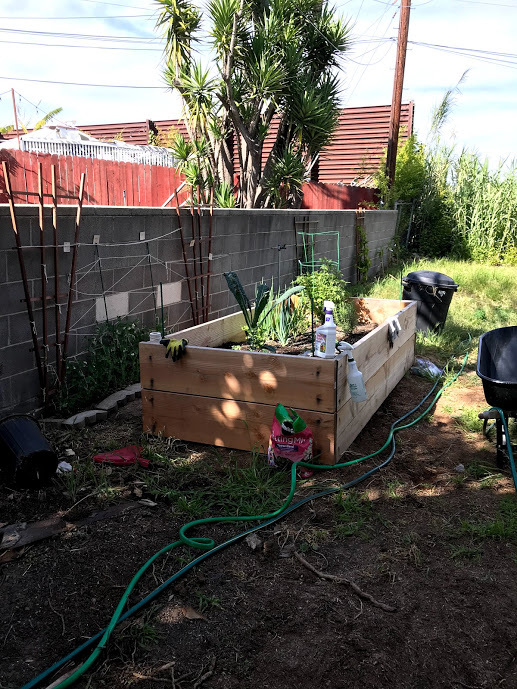 Then I plucked up all the weeds and grass surrounding the raised bed because they were warping the wood and relocated the trimmings to cover the plants and trees. It’s basically free mulch and will help our plants’ roots retain moisture. 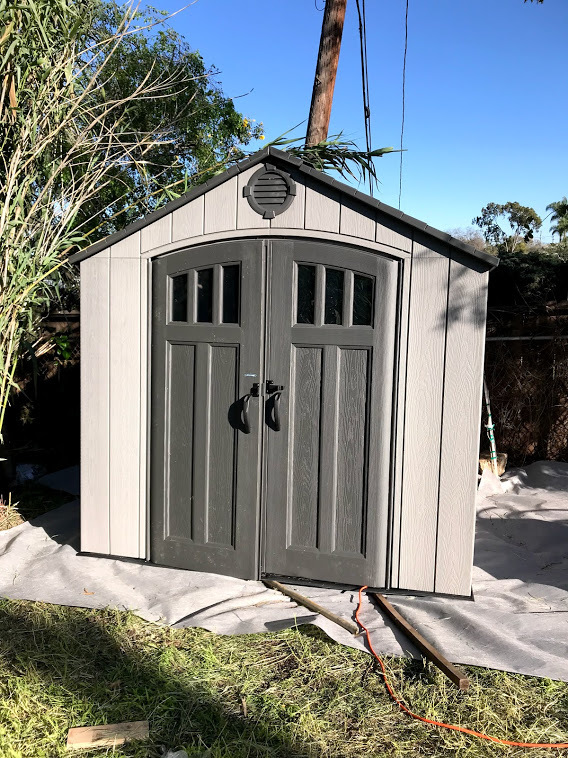 Alex’s task was much more difficult so on Sunday, he hired two day laborers (including Freddy, the same person who helped him assemble the shed a few weeks ago). Freddy brought one of his dudes who came with his own tools including a huge axe. Alex also rented a tree stump grinder from Home Depot which Freddy helped transport in his truck. 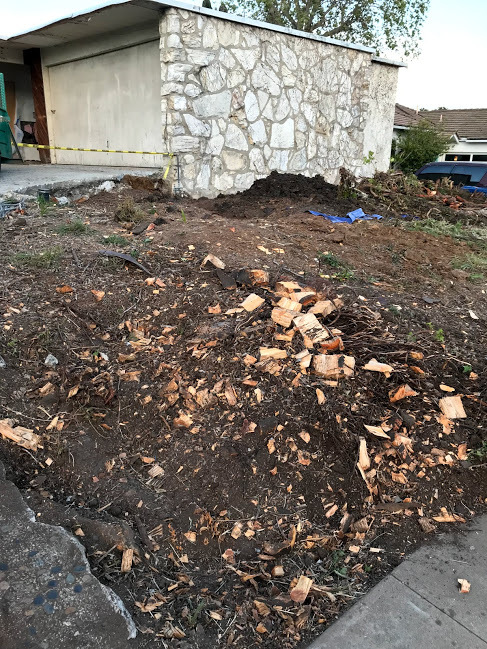 After about 4 hours, they removed the two large stumps on the side, two stumps in the back near the fruit trees, one stump near the veggie bed, another stump near the living room window, and one by the backyard stairs that was buried under ivy and old brush – 7 stumps total! It was a ton of work but much cheaper than if we had hired a tree removal company. 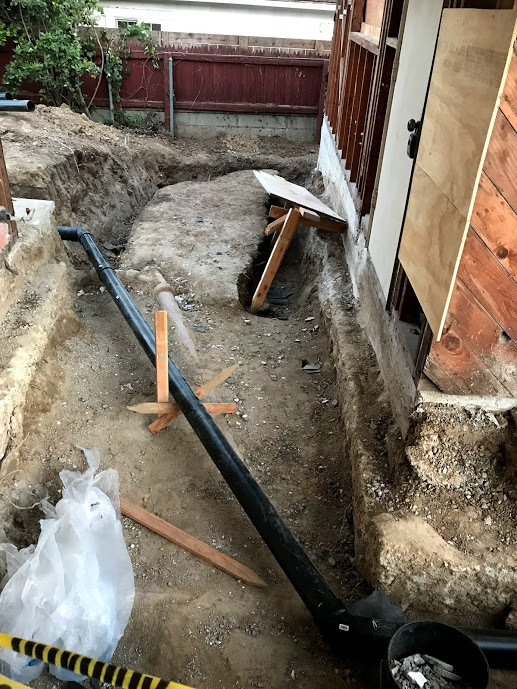 After the garage conversion is complete, we’ll work on building a DIY irrigation system. There are rusty hose hook-ups in the backyard which we’re hoping to get up and running with a little rejiggering. Towards the end of the week, our contractor and his crew got the pipes in place, removed the garage door, and framed out the windows. It’s starting to take shape, and now all we need is the city’s permit approval so we can start bringing these blueprints to life. Less than a week into demolition, we’ve already uncovered our first big “surprise” – the plumbing. We’re not completely blindsighted though. 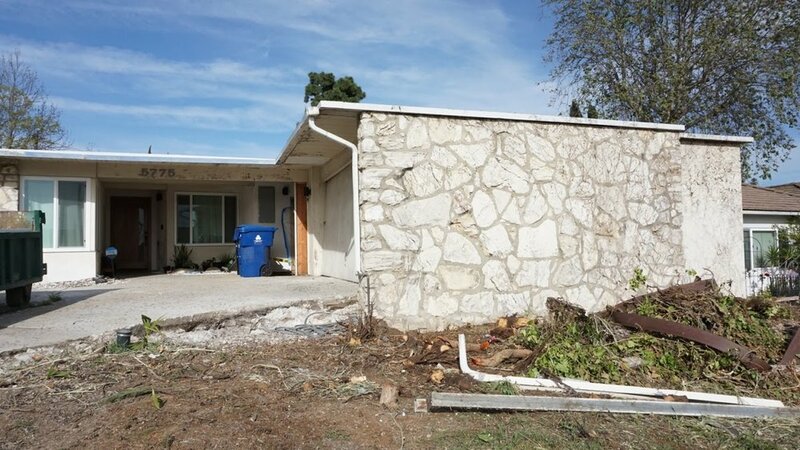 When we bought the house, we knew that the plumbing and electrical were extremely outdated. On top of that, the lack of maintenance over the years has led to overgrown tree roots infesting the pipelines. In simplest terms, we’ll need to introduce a new sewage line for the kitchen, laundry room, and garage conversion/ADU. Like I said above, the root of the problem originated from the enormous ficus tree that used to be in the front yard. This was also the very first thing we removed as soon as we closed escrow on the house. However, the root infestation damage had already been done. Years of neglect meant that the roots were growing uncontrollably underground. When they dug to expose the sewer pipelines, they also realized that the pipes were old and even had a small crack where water was pooling. This meant that the roots had a constant source of water to continue growing into spider web-like tendrils. 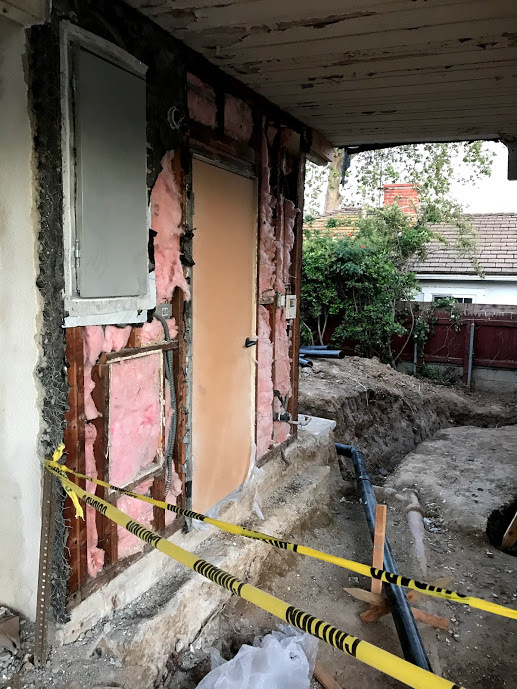 Our contractor and his plumber were also able to make informed judgments about the work that’s been done on the house over the years. 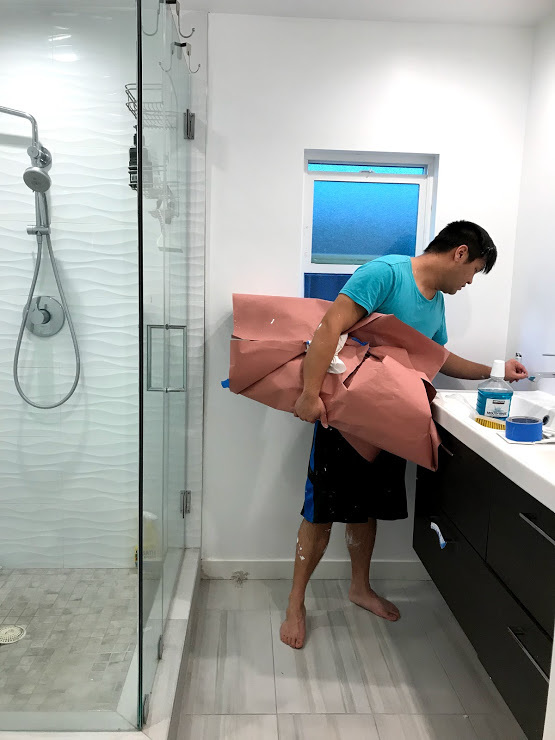 In short, there are two sewage lines that connect to the main sewage line: one that connects the kitchen and the other that connects the bathrooms. We hired a plumber last year to clear the bathroom lines, and the plumber yesterday was able to run his scope clearly through it (no root infestation there, yay!). 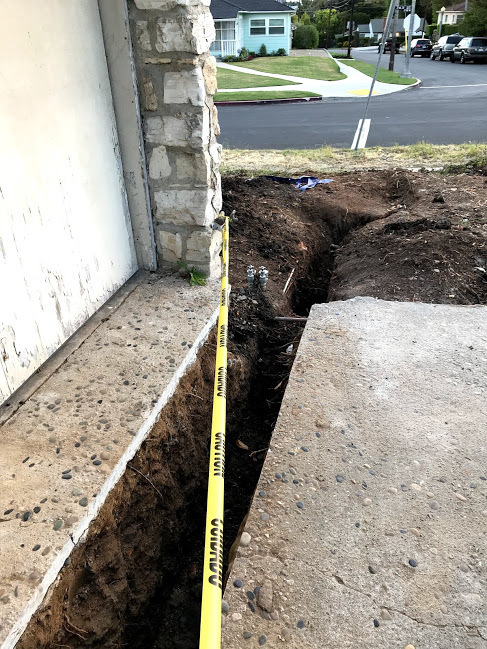 We’re actually pretty happy that we’re discovering all of this now (instead of after re-doing the landscaping or driveway and then needing to go back and rip it out ). The new plumbing work is expected to set us back by one week during which we are advised not to use the kitchen sinks or dishwasher. Ah, the joys of home ownership. A few weeks ago, I took my very first bread class at The King’s Roost in Silverlake! It was Alex’s super thoughtful Valentine’s Day gift to me, and I was both excited and nervous because I wasn’t sure if my skills were “advanced” enough. Turns out, there was nothing to be worried about and I can’t wait to go back and learn something new. My class started at 1PM, and I arrived a couple minutes early to get situated. I brought my 12 qt. plastic bin that I’ve been mixing my dough in and a notebook with questions. The entrance to The King’s Roost is in the back, and there’s a small parking lot for easy access. As soon as you walk in, there’s a small storefront full of breadmaking tools, flours, grains, mills, and other homemade goods. There’s also a long table where my classmates and I set our stuff down, and a kitchen and countertop where the class was hosted. My class was relatively small (5 women including myself) and we immediately started getting to know each other. 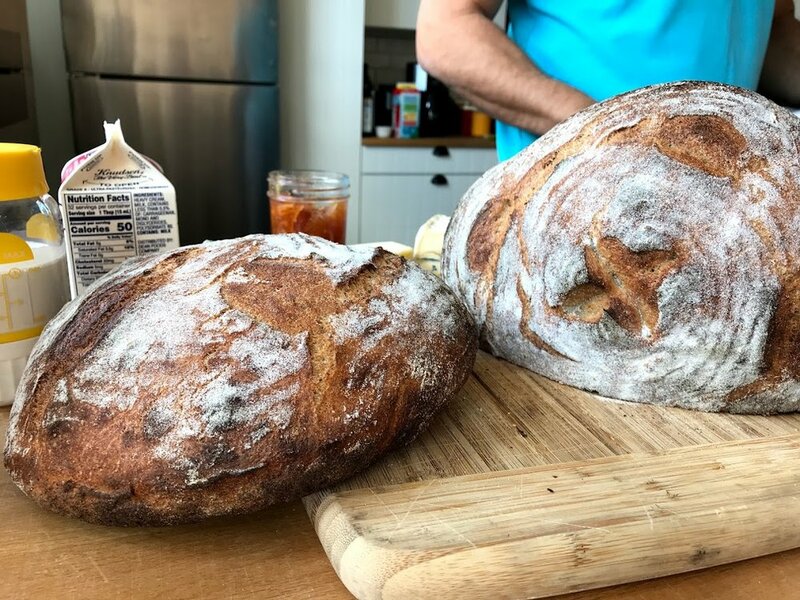 Many of them were semi-familiar with breadmaking and grew up with a love for cooking, but not necessarily sourdough experts. One woman didn’t even realize she had signed up for an advanced class! But Roe was such a great teacher and so supportive as he answered our questions and walked us through the process. My biggest takeaway was Roe’s deep knowledge of grains and flours and even deeper appreciation for all things handmade. As soon as the class started, he started telling us about his DIY tilapia pond, aquaponics setup, and his colorful experience with sheep herding, beekeeping, soapmaking, and of course breadmaking. As he told us more about his background, he toasted 2 loaves of pre-made bread for the class to munch on and served us coffee. After about an hour, he started teaching the class and showed us his techniques for mixing a fresh batch of dough from start to finish. Then he brought us to the storefront and explained the uses for hard white flours vs. soft white flours, locally grown whole wheat grains, ancient sea salt, and more. Finally, we milled our own flour and started mixing our dough alongside him. As we wrapped our dough to bring home and finish rising, Roe’s loaf was fresh from the oven and ready to enjoy. As he was slicing into it, he also whipped fresh butter on-the-spot with whipping cream and this really nifty Chef’n butter-making gadget. It was the most wholesome, fresh experience that made me love bread even more than I already do. As class concluded, we took home some of Roe’s bread and sourdough starter. Each of us also purchased something from his store and exchanged contact info to coordinate taking classes in the future together. If you’re a maker or a baker, you must take one of Roe’s classes! In preparation for the garage conversion, we bought an 8’x8’ Lifetime shed at Costco for extra storage. It turned out to be one of the most complicated things Alex has ever had to assemble. 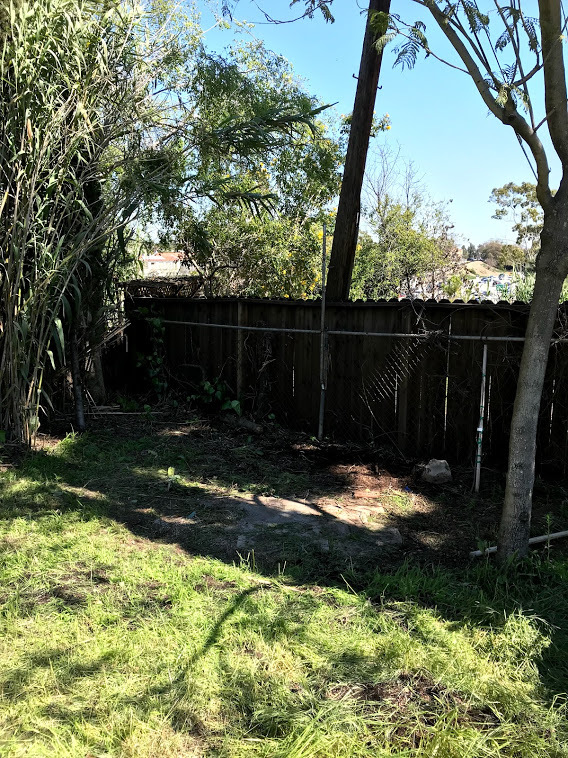 First, we cleared the old, creepy shed and tossed all the random junk including old tools, yard supplies, and wheelbarrows full of branches and dry brush. We tried to level the ground as much as possible and laid down weed barrier fabric. Then we weighed it down with leftover concrete stones to create a flat base. There was so much to clear in that corner that Alex even broke our shovel in the process of clearing out old stumps and roots. We had planned to buy the shed on Saturday morning at Costco, but it was huge and heavy. 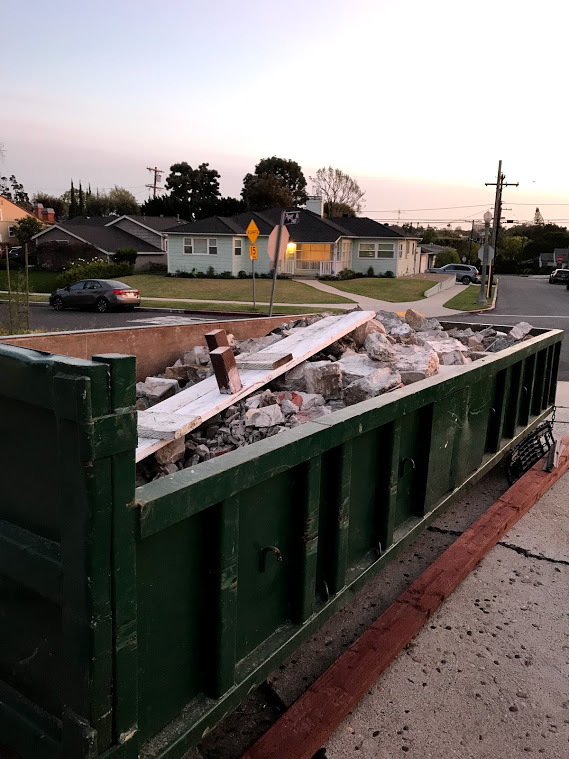 So instead, Alex rented a U-Haul on Sunday, headed to Costco to buy the shed and pack it in the truck, and then hired a day laborer named Freddy to help for over 6 hours. It was basically like building a small house with tons of puzzle pieces and screws. After they finished, we moved everything out of the garage and into the shed. 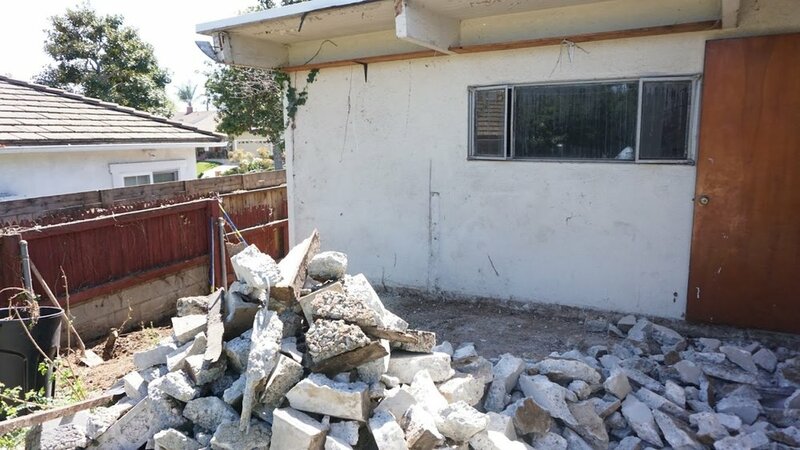 Anything that was left in the garage would be trashed and demolished. The garage was never this empty, even when we bought the house and moved in. 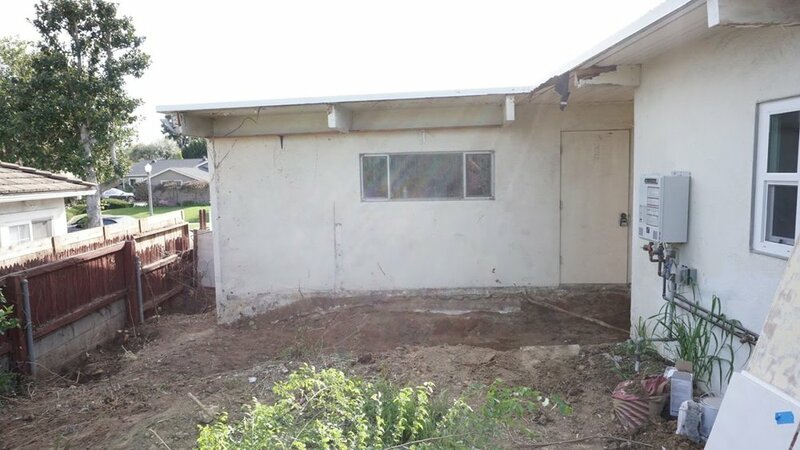 We’re so excited to transform this space into a cozy, inviting, usable extension of the house! We were finally ready to start painting again after a short hiatus from the holidays. 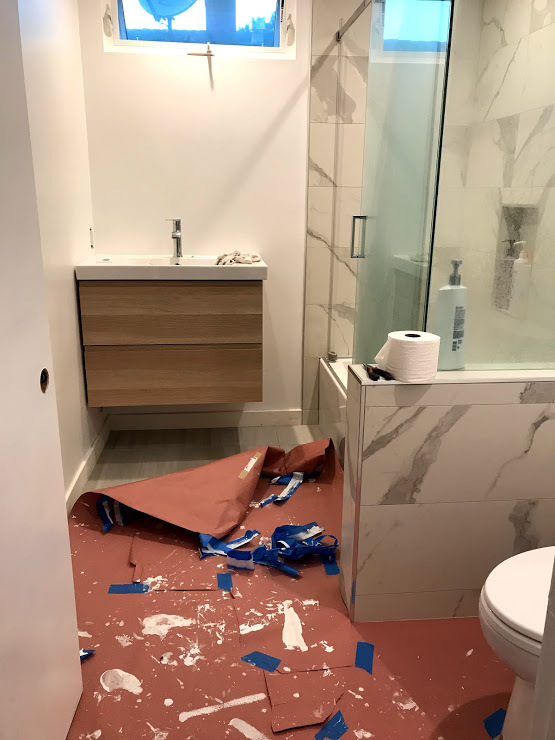 The bathrooms have had bare drywall since we moved in, and we wanted to do our due diligence to research the proper moisture-resistant paint. We stopped by Dunn Edwards to pick up 2 gallons of Vinylastic primer and 3 gallons of low sheen white paint. We kept it simple and chose plain white instead of hemming and hawing over which shade. We’d rather use that time to actually paint. We also ordered more paint brushes from Amazon, paint kraft paper to protect our tiles, and paint rollers. Each time we start a new project, we realize how much we’ve learned from before. This time, we were much better about applying coats consistently and cleaning up immediately. Our friends Kat and Jeff also came to lend a hand which made the entire process much easier. They painted our guest bathroom while we did the master bathroom. The end result is gorgeous and exactly what we wanted. It’s clean with just enough shine. The Dunn Edward paint is noticeably higher quality and we’re excited to use it on the cabinets in the bedrooms. Onto the next project! We spent our annual Valentine’s Day weekend in San Diego with the pups. It’s a tradition Alex and I have enjoyed since we started dating. Our plans stay generally the same, and it’s one of our favorite holidays to reflect on the year before. We drove down on Friday night after work and stopped for carne asada fries (as always) before checking into our Airbnb. This time, we discovered El Zarape after a quick Yelp search and it ended up being the best one we’ve had so far. 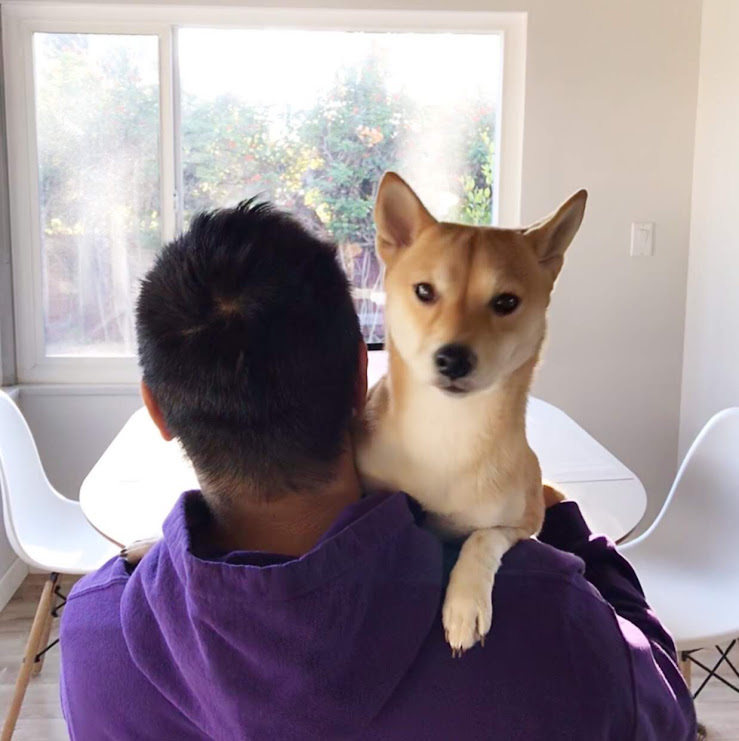 Our choices of Airbnbs are limited to dog-friendly locations, but we tend to stay around the Mission Bay area. This time, our Airbnb overlooked a canyon and we could even see the ocean in the distance. 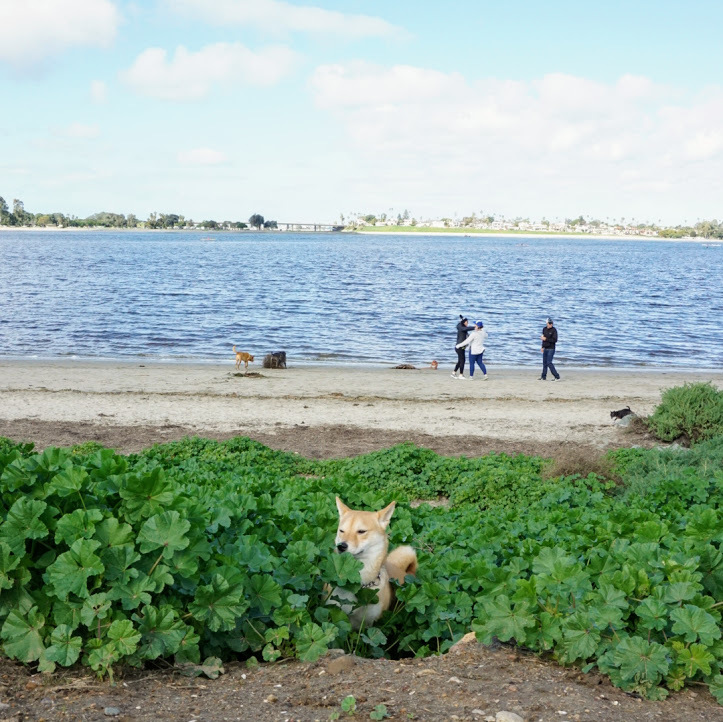 Saturday morning was spent at Fiesta Island dog park. It’s kind of what I imagine heaven to look like. It’s 2.5 miles of gated dog park surrounded by the beach. The entire island itself is 5.4 miles. It’s clean, there’s plenty of parking, and this time it was super lush thanks to the rain lately. All the dogs stayed in their packs and literally bounced out of the tall grass and bushes. Shabu loved frolicking and zooming around the hills while Chef stayed close with us, enjoying the fresh air and sunshine. Afterwards, we grabbed lunch at our go-to: El Pescador in La Jolla. We got there around 11:30 – no line and plenty of open tables. I always order the halibut sandwich and Alex got the seared ahi tuna sandwich. Within walking distance, there’s a popular bakery/brunch spot called Sugar & Scribe where we grab coffee. Coincidentally, my cousin’s husband just started as a baker there. After a quick nap, we headed to the mall. It’s actually a special place for us that reminds us of when we were first dating. We once went to this mall together for a SD day trip to hunt down the Hello Kitty Cafe food truck. At that time, we also bought hoodies from American Apparel that I DIY’d into Sully and Boo hoodies for Alex’s birthday trip to Disneyland. Dinner was spent at our usual spot: Cafe Coyote in Old Town. It was a quick 20-minute wait, and the best part are the handmade tortillas as you wait in line. For just a few dollars,you’ll get handed a couple fresh, piping hot tortillas. Everything on the menu is amazing and we always share a margarita. We were also able to catch up with my cousin Jason at Extraordinary Desserts (who just moved to San Diego in September). The last time we saw them was when they were living in Tokyo. After one more trip to Fiesta Island on Sunday morning, it was time to head back to LA and prep for dinner. 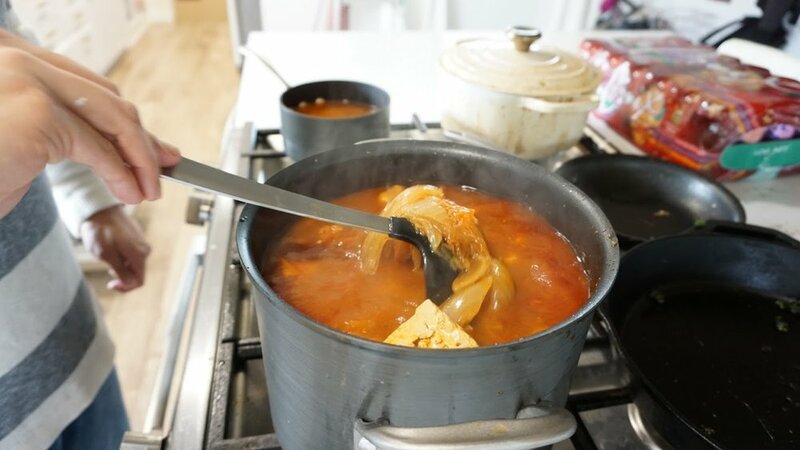 Alex’s family came over and we made another batch of kimchi jjigae (stew) with kimchi sent directly from Uncle Jae Joon in Korea. Full weekend, full hearts. What the Heck is "Hygge"? While everyone else is Marie Kondo-ing their homes and figuring out what sparks joy, I’ve been cozying up to the concept of hygge. It’s just another reason for me to love Denmark more than I already do (have I mentioned how obsessed I am over Nadine Redzepi and her cookbook “Downtime”?). In essence, hygge is a Danish and Norwegian word to describe a mood of coziness and wellness. It’s about enjoying the simple things in life and embracing the comfort of home. One of the podcasts I listened to actually described hygge as a verb. While Americans tend to think of “coziness” as a noun and a state of being, the Danes think of it as something that’s actively pursued; quite literally, hygge loosely translates to “to cozy.” The word “hug” even directly stems from hygge. 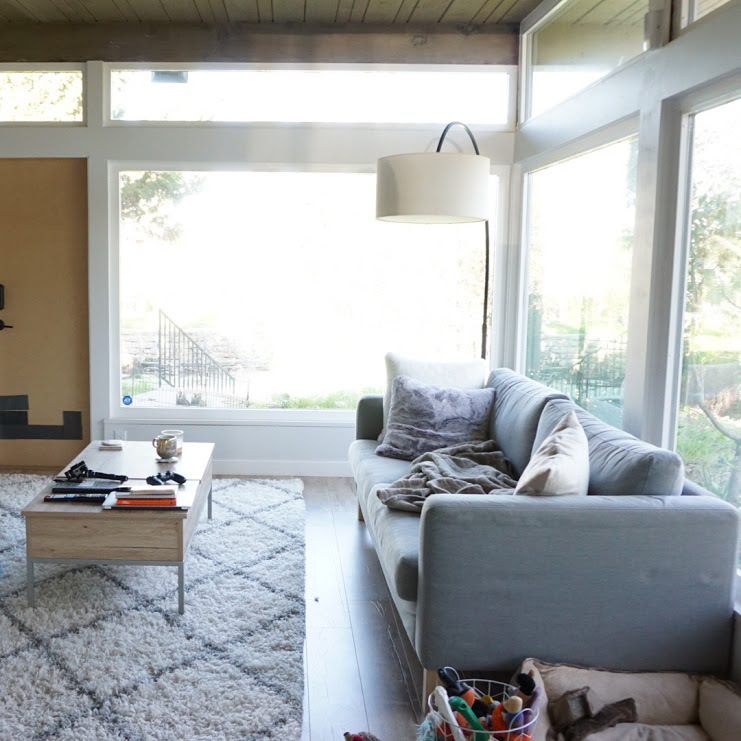 Over the past month, we bought armchairs and a floor lamp – the finishing touches to bring together the living room and unintentionally boost hygge. 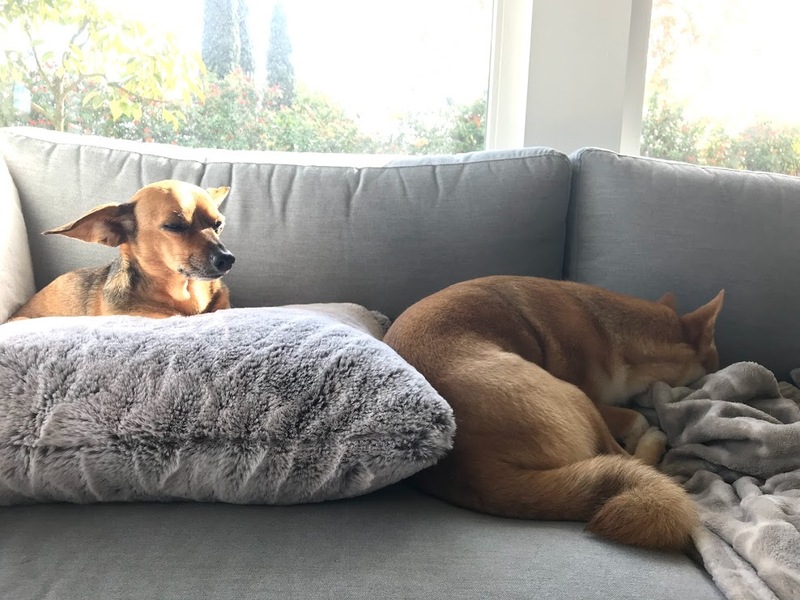 We’re talking throw pillows, a fleece blanket with both dogs nestled beside me, a good hardcover book, an Anthropologie candle, smooth jazz on Spotify, and the recent LA rain gently pitter-pattering against the window pane. Pure bliss. 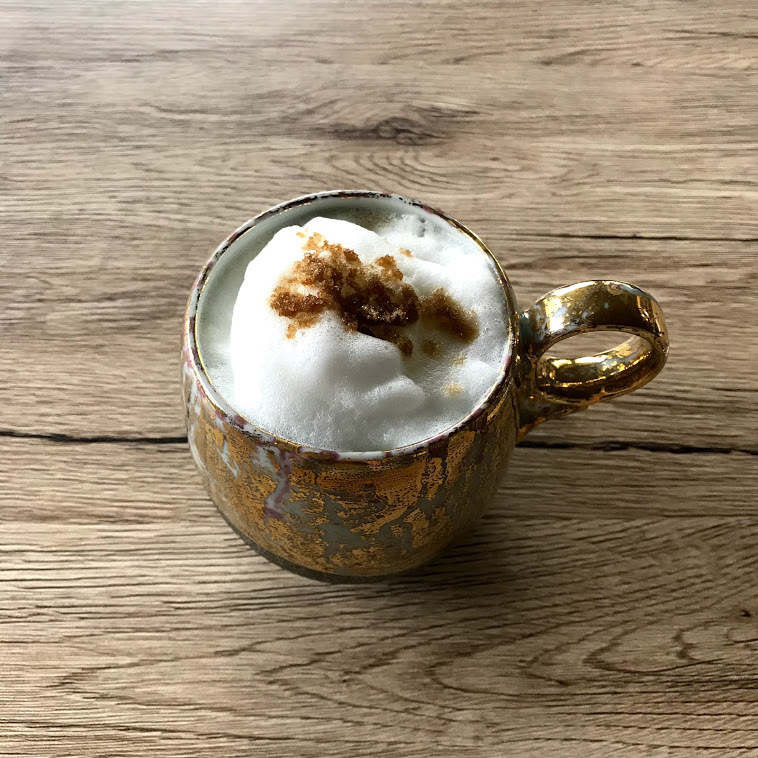 Here are my favorite ways to indulge in hygge. Studies have shown that Danes burn more candles than any other European country. The hygge is real! After the holidays, I scored some deep discounts on candles at Home Goods, World Market, and Pier 1 Imports. And don’t forget to save your candle jars to use as pots for plants. Eco-friendly and cozy! SImilar to candles, lamps are an important part of creating the perfect atmosphere. The Danes take great pride in light fixtures and strategically plan where to place their light sources. It’s more important to have small pockets of intentional light rather than a central light source that overpowers your space. Keep it light but not too bright. The feeling of pulling something fresh out of the oven has hygge written all over it. The warmth, the smells, the joy of sharing with your loved ones. And even if it’s not bread, any comfort food like pasta, soup, or cookies also work. Ramen pictured is from Ippudo! There’s a fine line between coziness and laziness, but the beauty of hygge is that you can make it your own. Whatever brings those warm fuzzies to your heart and mind. 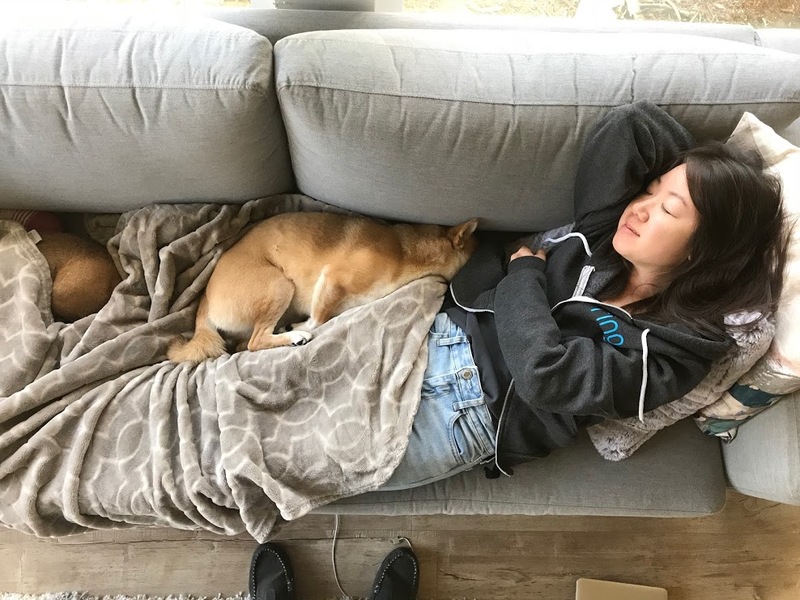 We took it easy for New Year’s day. Over the following weekend, we took the dogs to get their annual checkups. I changed my name on my driver’s license. We saw “Wicked” for the second time. We got a new camera to take nicer photos of the house and for our travels. I got a new basil plant to keep indoors (my previous basil plant never flourished ever since I moved it outdoors). I also tried to rescue the lettuce in the raised veggie bed from mold, but alas, they succumbed. I made more bread, including a stuffed focaccia. Now I’m trying to figure out how to make larger air holes in my bread now for an even better crumb. We arranged a gallery wall of photos (motivation to finally print our wedding photos), bought a West Elm lamp for the living room, got armchairs from Amazon, and hung up a wall clock from Muji. And finally, we celebrated Alex’s 30th birthday at Tres by Jose Andres (followed by dessert at Milk Bar), Osteria Mozza, and Dave and Buster’s. Soft, chewy, and light as a pillow, milk bread is probably #2 on my bread list. I have very fond childhood memories of picking up a loaf from Mitsuwa and smothering it with salted butter. This recipe is super easy and pretty hands-off (if you have a stand mixer and kitchen scale). It’s also really fun to watch the dough rise at each step. The roux-like tangzhong is a crucial step that gives the milk bread its signature fluff. 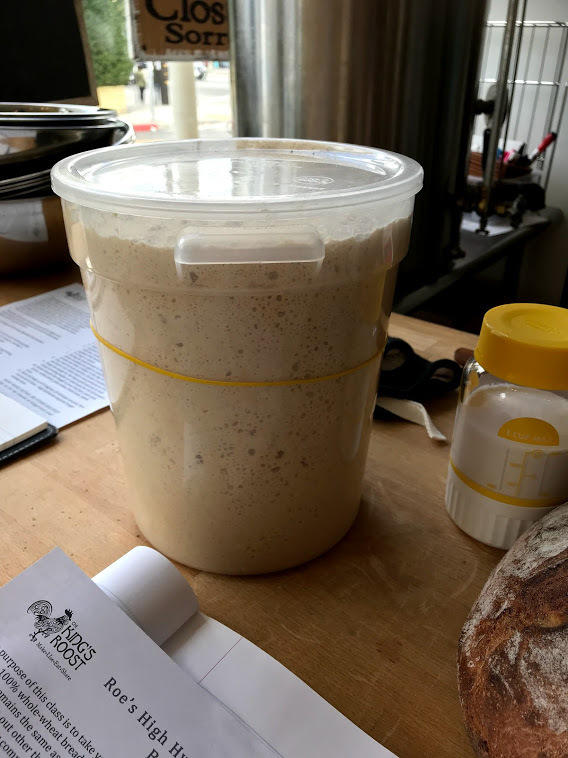 Activate Yeast : Mix the warm milk, sugar and yeast in a small bowl. Stir and let sit for 10 minutes. Tangzhong: In a small pan over medium low heat, combine the milk and flour to make the tangzhong. Stir for a couple minutes until it thickens. Remove from heat and let cool. 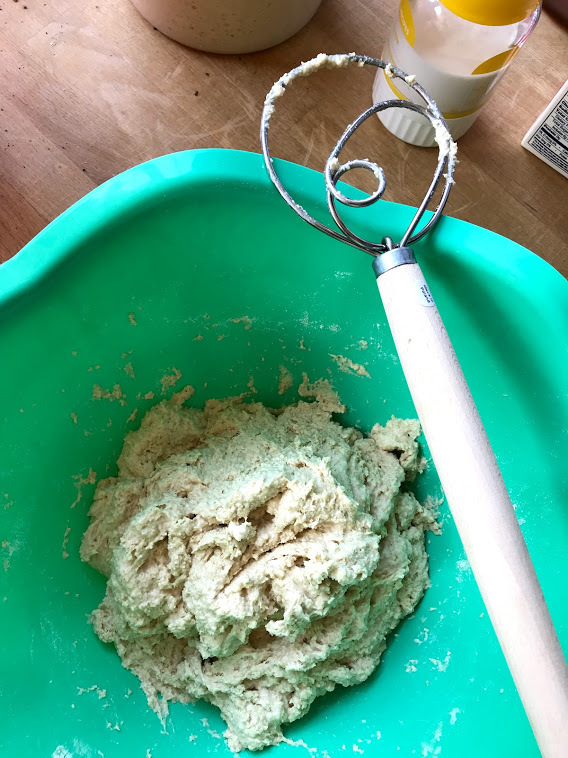 Make Dough: In a stand mixer bowl, whisk the bread flour and salt together. Crack the egg in, add the yeast mixture and the tangzhong. Stir until it roughly comes together. Knead: Set the stand mixer on low and knead for 5 minutes. Add the butter and knead for another 5-7 minutes. The dough should be sticky and springy. First Rise: Cover the mixer bowl with a towel and allow the dough to rise in a warm, draft free place for 1 - 1½ hours or until it doubles in size. Shape: Divide the dough into 3 equal parts and shape each into a ball. Using a rolling pin, roll out the dough until it becomes a long oval. Fold one side (lengthwise) into the middle and then fold in the other side as well. 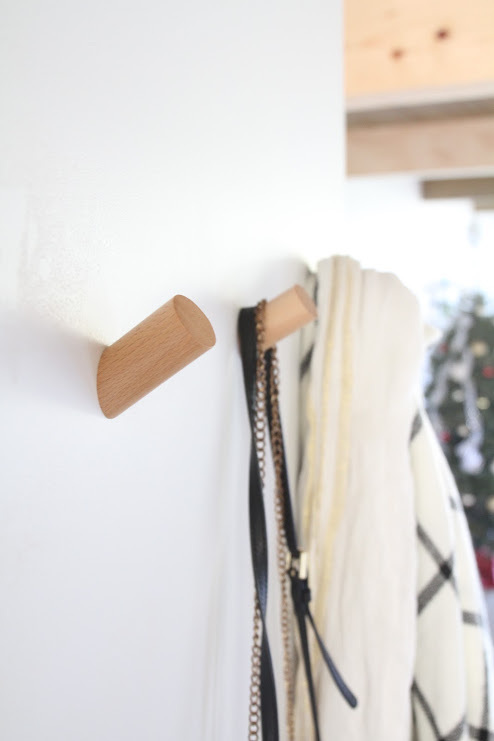 Flatten with a rolling pin. Gently roll the dough into a cylinder and pinch the seam at the bottom. Place it seam side down into a greased 9" X 4" loaf pan. Repeat with the remaining two dough. 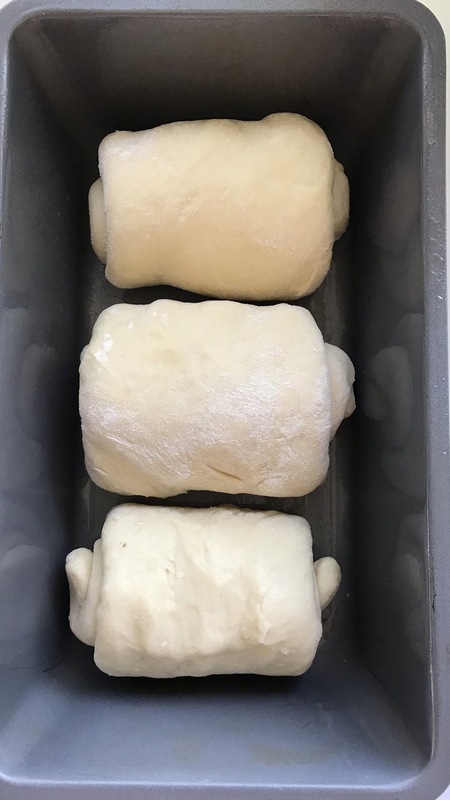 Second Rise: Cover and let rise again for 1 - 1½ hours or until double in size (or top of dough has risen over the top of the pan by about an inch. 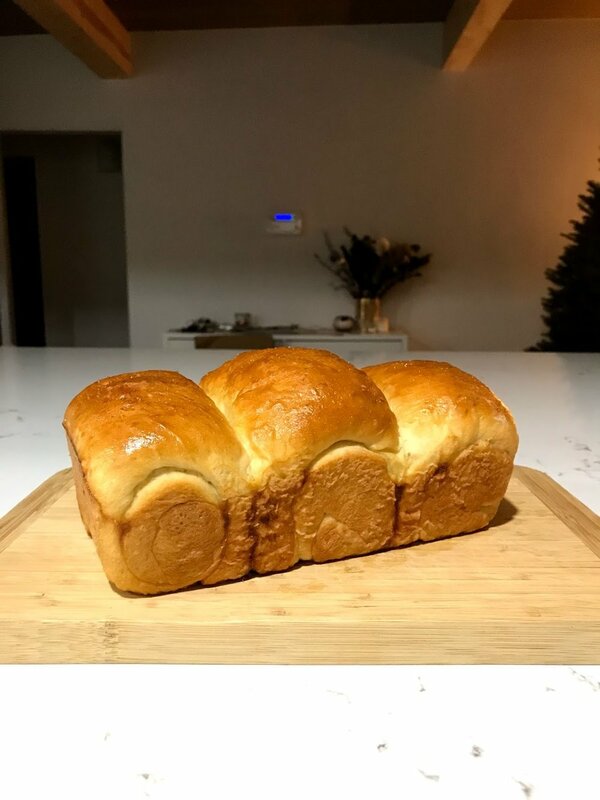 Bake and cool: When the bread is ready to bake, brush the top of the bread with egg wash and bake for 30 minutes at 350º F. Remove the bread from the pan, let it cool on a wire rack, and take lots of Instagram photos! It’s so beautiful and you did so, so good! To celebrate our holidays as a newly married couple, this was the first year that Alex and I have ever spent Christmas together. I joined his family for a week on their annual trip to Lake Tahoe. Although it was a little strange to not make the trip home to Chicago like I have been for the past 10 years, this was a more relaxed celebration after our crazy busy year. We left on the Saturday before Christmas with a rental car full of snowboarding and skiing gear, the two dogs and their toys/food/bed, our duffel bags, the Instant Pot, and boxes full of groceries. 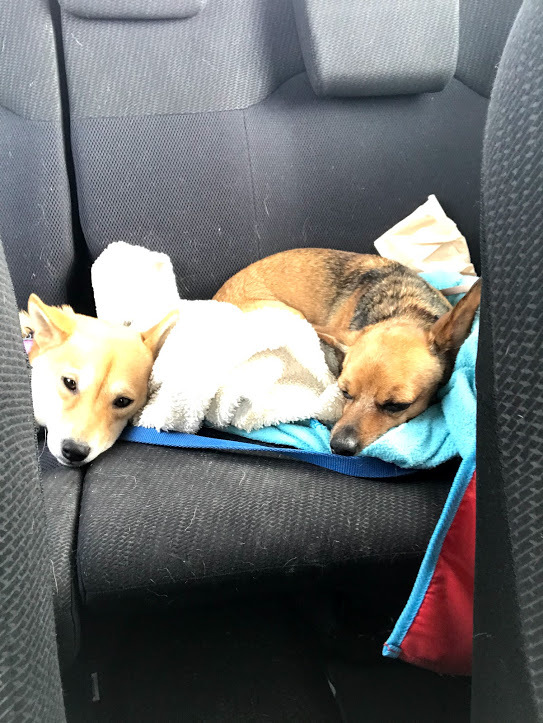 The drive was long but relaxing, as both dogs fell asleep in our laps and enjoyed having our full attention. Since we were staying at dog-prohibited area in the Hyatt, we had to keep the dogs at a pet hotel in Truckee. We missed them so much, but it was the best solution and we knew they were in good hands. The Truckee-Tahoe Pet Lodge was the nicest pet hotel we’ve ever booked for the dogs. It was cozy, the staff was super friendly and responsible, and Chef and Shabu were happy to be together in the same room. We even went to visit them for a day and took them out for a few hours, and they actually seemed eager to go back to their room. 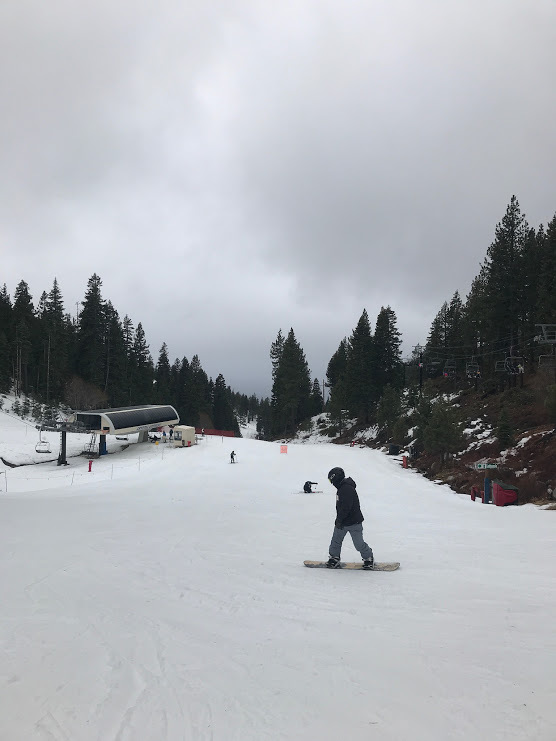 We snowboarded a total of 3 days at Diamond Peak. I haven’t nailed carving yet, but I’m not giving up! I’ve still watching YouTube videos and am excited to try again on our next snowboarding trip. I am, however, able to consistently depart the ski lift without falling which is a BIG win for me. I’m not a pro yet, but I’m definitely improving. On Christmas day, we even soaked in the jacuzzi after our snowboarding runs and then huddled around the fire with hot chocolate. We returned home a week later, eager to relax at home, clean, and eat veggies. The dogs were also VERY happy to be home and immediately tucked themselves into bed. Alex and I are avid coffee drinkers. We each drink at least two cups a day (maybe even more since Alex is working from home). Even though we have a cold brew infuser, we found ourselves craving hot coffee now that the weather is colder. Cyber Monday was the perfect day to treat ourselves to our very first Keurig. I'm pretty obsessed with how easy it is, and I love having the option to add foam at the push of a button. Hence why I decided to learn how to make milkbread for optimal coziness.